The summer 2015 edition of 1300 Elmwood, the magazine for SUNY Buffalo State alumni, is now available in print and digital formats. Read the current issue to get updates on your alma mater, catch up on fellow alumni, and learn how Buffalo State continues to transform lives. 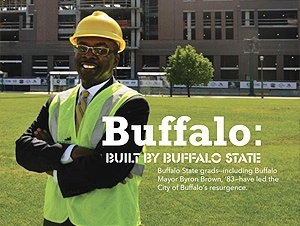 Cover story: "Buffalo: Built by Buffalo State"
Buffalo State grads–including Mayor Byron Brown, ’83, and Congressman Brian Higgins, ’85,–have led the City of Buffalo’s resurgence. Feature: "Provost Caps Remarkable Career"
Beloved administrator and teacher Dennis Ponton retires after nearly 40 years of service to the college. Feature: "Start Spreading the News"
Television and film arts students find filmmaking success in New York City and Hollywood.